Microsoft Office 365 delivers the power of cloud productivity to businesses of all sizes, helping you save time, money and free-up valuable resources. 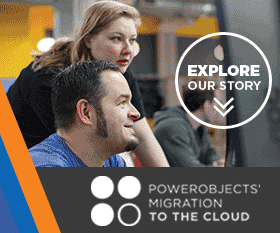 PowerObjects can help you make the switch to Office 365. See how Adaptive Solutions uses Office 365 to help support their mission to empower clients to make fact-based decisions. Get access to your email, calendar and contacts from any web browser on virtually any internet-connected device. With 50 GB storage, you can send attachments up to 25 MB and have endless archiving options. Exchange Online plays a large part in processing email and messages generated by Dynamics 365, including outgoing marketing emails, inbound messages and tech support questions. This is the downloadable version of the out-of-the-box Microsoft Office you would purchase from a retailer. It includes the newest version of Word, PowerPoint, Excel, OneNote, Access, Outlook, InfoPath and more, and can be installed on five devices. If you’re running an old version of Office and want to upgrade, or you always want the latest Microsoft products on your computer, this may be a good solution for you. OneDrive is a service that enables you to upload files to cloud storage and access them from a Web browser, PC or Mac — and mobile devices. No manual syncing or cables needed. With OneDrive, you’ll always have access to the documents, notes, photos and videos that matter to you. Just log on to a web browser, sign in to OneDrive and start viewing or editing. This is cloud communication at its best, with instant messaging and video conferencing that allows you to quickly ping your colleagues and get real-time replies. Set up real-time meetings, online training and web-based support sessions with colleagues and clients. Skype meetings can also be tracked in Dynamics 365 as appointments. Microsoft Dynamics 365 works as a natural extension of Microsoft Outlook, allowing you to manage customer email, appointments, tasks and contacts from a single, easy-to-understand business application. Organise and share team documents, create online knowledge bases and collaborate with your colleagues. SharePoint can also be integrated into Microsoft Dynamics 365. Now, exclusively through PowerObjects’ CSP program, if you purchase an Office 365 Business Premium, Office 365 Enterprise E3, or Office 365 Enterprise E5 license, you can get your Dynamics 365 Enterprise license for less!